I started this entry a while back, but for some reason I just kept holding back on completing it. I really didn’t know why until a few days ago. It’ll be pretty easy for you to connect the dots. I spent last weekend on the left coast, taking in some ECNL action as part of my recruiting duties. It’s interesting, the perception ‘outsiders’ have of our job. When I say I was in San Diego, the person I’m speaking with immediately gives a heavy sigh and a look of yearning as if my trip was automatically awesome. Their envy is a little misplaced. Yes, we get to go to a lot of cool places, but we don’t really get to do much once we’re there except watch soccer games. I was bleary-eyed and in bed by 9:30 every night. I tell people the most exciting part of the trip was the airplane ride. Yay flying! The event was held at the Polo Grounds, the same venue that hosts the Surf Cup tournaments. If you’ve ever been there, you know that the parking lot exists in a perpetual state of sogginess and mud. If it never rains in southern California, that parking lot must be built on a swamp. Anyway, for whatever reason, on this particular occassion that main parking lot was shut down, and I can’t be the only one hoping it’s because they’re going to put down some pavement. So instead of turning into that lot, cars had to drive past the entire complex and then circle back around on a dirt and gravel back road that runs through some woods behind the complex, and then into some makeshift grassy parking areas. It’s a pretty extensive little trek and for long stretches you can’t even see the soccer fields. The people who run the events at the Polo Grounds have always been awesome to college coaches. The volunteers go out of their way to make our lives easier and the food in the hospitality tent is always pretty darn good and plentiful. I cannot overstate how important that tent is to me and many others. With the new parking arrangement, there were a lot more volunteers on board and many of them were stationed along that back road, orange flags in hand, waving us along our route until we reached our destination. So early Friday morning I was in a line of cars slowly navigating our way along this back road. As I drove past the parking people waving their flags, I wasn’t in a good mood or a bad one. I was just ready to do my job and grind out the day with my crystal ball, watching high school sophomores play soccer. It was just another day at the office so to speak. But the fourth flag person I encountered completely changed my outlook. While the other parking people were stiff and disinterested and merely going through the motions (and could anyone really blame them? ), this woman was downright giddy. She had a big smile on her face and was waving her flags with gusto! She was being super silly and dancing around and really getting into it. For a weary traveler, it was fantastic! This woman had made it her personal responsibility to put everyone who crossed her path into a better mood than they were in five seconds earlier. And you know what? It worked! Splendidly! Just seeing that woman making such a great time out of a truly dull job put a smile on my face and sent a jolt of good energy through my veins. I nicknamed her the Happy Parker. Since forever ago, coaches have been telling their players that their moods, good or bad, are contagious. If you choose to be enthusiastic, your teammates will follow. If you choose to be bitter and shallow, trust me, some teammates will join you. But the point is, every player is contagious and one person’s enthusiasm will lift others. You are only one person but do not underestimate the value of being one person. It was so cool to see the Happy Parker personifying that lesson and I thoroughly enjoyed relearning it. Anyway, outside of seeing some quality soccer, the Happy Parker was the real highlight of my trip. Funny enough, by the second morning, almost all of the flag people had joined in the silliness. They all seemed to be having a great time waving those flags. I wondered how much of that was the result of that one woman. In February I went back to Embry-Riddle to induct one of my former players into the Athletics Hall of Fame. It was the second time a women’s soccer player received induction into the Hall. Abby Odom was part of the university’s inaugural HOF class in 2009, but I was recruiting overseas and had to send in my speech via DVD. It was nice to actually be there this time and do my spiel in person. I’ve been coaching at the Division I level for six years now, but I spent the 16 years prior coaching in the NAIA. Since the moment I made the move, it’s been impossible not to make comparisons between the divisions. Some comparisons I still can’t get over, namely in terms of budget and how it affects our ‘quality of life.’ Let me put it to you this way: in the NAIA we didn’t do a whole lot of travelling by charter plane. Every time I start climbing the steps to one of those private planes, the theme song from The Jeffersons starts rattling around in my brain. By the time I get to “movin’ on up,” I’m smiling, snapping and singing out loud. Of course some other comparisons aren’t quite so blunt. Some are more hypothetical. I’ll catch myself thinking about which of my former players could start for my current team, which ones would get some minutes, which ones might make the team. But there is nothing hypothetical about the best leader I’ve ever coached. Her name is Katrina Morgan and I was welcoming her into the Hall of Fame. I’ve been given 3 minutes to summarize for you Katrina Morgan. Anyone who knows Katmo knows that that is a physical impossibility. So let me just begin by saying that Katmo never went halfway at anything. Regardless of the task in front of her, no matter how big or how small, Katmo threw her entire self into doing it, and doing it with excellence and enthusiasm. Leadership is a funny thing when you’re a coach. You don’t truly know what a great leader is until you have one. And you don’t fully appreciate the impact a great leader can make on your team until you’ve seen it firsthand. And once that player is gone, it becomes really difficult for a new leader to measure up. And as talented as she was at playing soccer, I think what her teammates would remember most about Katmo was her amazing leadership ability. It was her defining quality and it transcended anything I’ve seen in my coaching career. It was both sublime and indescribable. To put it into a more tangible form, let me just say that I made Katmo a captain of our team in the second semester of her freshman year. Think about that: A freshman captain. I don’t know how a decision like that can possibly be overstated. Katmo led by being our hardest worker, every single day. She led with boundless enthusiasm. She led by refusing to accept mediocrity from herself or her teammates. And she led by never ever taking a day off. Katmo excelled at so many things – soccer, ROTC, academics, community service… and she did all of these things with excitement and passion and a smile on her face. Her effect on others was practically chemical. Whatever project Katmo chose to join, her presence made that event more enjoyable for everyone involved. She had this remarkable knack for getting people to thoroughly enjoy themselves more while simultaneously motivating them to accomplish their task at a higher standard. If her aura could talk it would’ve said: Let’s be complete goofballs and kick everybody else’s tail. It was a mystifying combination and I’ve never met anyone else who could pull it off more consistently. For Katmo it just came naturally. Katmo’s across-the-board excellence puzzled me… heck, at times it obsessed me… and I thought about it… a lot… because I just couldn’t understand how one person could be so damn great, at so many things, and all the while exist in a wonderfully upbeat and happy mood. It completely defied human nature. Most overachievers are wound up pretty tight; but Katmo was more like a cartoon. I wanted to know exactly what she did to excel at everything and to simultaneously be perpetually joyful. I wanted to know how she could be such a positive life force while still being extremely goal-oriented and competitive. You know the motivational speaker Anthony Robbins? Compared to Katmo, he seems clinically depressed. If I could figure out the secret to her excellence, then bottle it and give it to my whole team, we’d be completely unstoppable. And believe me, I would have been the first person drinking the Kool-Aide. Eventually I decided that there was just no way Katmo’s joyous spirit could come naturally. At least not entirely. Not a hundred percent. Maybe 90% of it was in her DNA, but even that was hard to swallow. No one wakes up that happy every day; not with her course load and her commitments and her drive to achieve. This is a girl who, to the chagrin of her teammates, kept a CD of Christmas music playing in her car all year long. The kid was captain of her soccer team, an ROTC officer, a 4.0 student, a Presidential Scholar, and oh yeah, she flew airplanes. Those are some high-stress activities, things that she cared deeply about, and she nailed every single one of them and did it day after day with a smile on her face. It doesn’t seem possible, right? I didn’t think so either. I wasn’t buying the DNA argument. One day I concluded that Katmo must have some type of morning ritual. I envisioned her waking up and walking into her bathroom and reading some type of self-empowering maxim that she had taped to the mirror. It told her how to live the day; how to choose her attitude and her emotions and her response to whatever life threw at her. It told her that the day could be amazing if she simply made it so. And she followed those instructions to the letter. Every stinkin’ day. That was the only way one person could live her life and live it in that positive fashion. I’ve never seen one person have such a powerfully positive effect on everyone around her. Katmo chose to be excited and enthusiastic and happy and courageous, and it affected her teammates in the best possible way. If you weren’t there to experience it, there’s really no way to convey what a powerful leader Katmo was. I cannot possibly stand up here and talk to you and do it justice. So I’ll just say this… Katrina Morgan has become my measuring stick for what leadership means in a college soccer program, and I have a hard time believing that’s ever going to change. With all of this talk about what a great leader she was, I don’t want to lose sight of the fact that Katrina Morgan was also one helluva soccer player. She imposed herself on games like no one else, and it was thanks to her sheer determination and an indomitable force of will. That was one of the really cool things about Katmo… she believed that her determination could conquer anything. 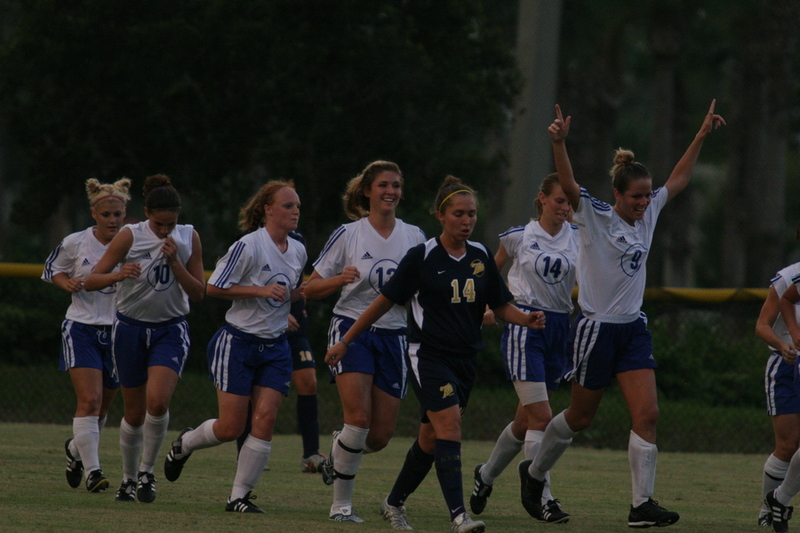 Katmo won just about every award there was to win, athletically and academically, and it was very befitting that in 2004, we won the Florida Sun Conference championship thanks to her goal in sudden death overtime. There was no one more deserving of a heroic moment. As happy as I am that tonight we are honoring her for her achievements as a college student-athlete, I am also here to honor her for what she has done since graduation as a member of the United States Air Force. Ladies and Gentleman, please join me in welcoming #9, Captain Katrina Morgan, into the Hall of Fame. That was the speech before I pared it down to (roughly) three minutes. I decided to post it because only a few of Katmo’s teammates could attend the ceremony, and I wanted those who weren’t there to have an idea of what was said. And you know what… for as much as I tried to convey Katmo’s personality and convince everyone of her performance as a leader, I’m still seriously unsatisfied with it. It goes back to the first two sentences; it is a physical impossibility to describe her in three minutes… or three days. Coaches long for players with alter egos: sweet, happy, disciplined, socially well-adjusted and responsible off the field; and cold-blooded killers on it. It’s a pretty tough balancing act, and no player has ever bounced back and forth between those two worlds better than Katmo. One minute she might help a teammate learn a new 1v1 move, the next minute she’d be trying to pulverize that same teammate in a 1v1 drill. Her sportsmanship was superb, but that wouldn’t stop her from trying to beat you by a hundred goals. She wanted to compete fairly, but she also wanted break your spirit while doing it. As well as any player I’ve ever coached, Katmo separated her competitive life from her regular life. She was a model citizen who also happened to fully understand that the singular purpose of competition is to find a winner, and she had no hesitation about doing whatever was necessary to win. One of the very best parts about being Katmo’s coach was that she trusted me. Not because it was me necessarily, but because I’m the guy who happened to be her coach. Her attitude was like, okay, you’re the coach; you set the plan and I’m going to follow it with everything I’ve got and I’m gonna hope like heck that you’re right. You see, a coach can only try to tell players some of the important messages; we can’t force them to internalize those messages. That’s why all of us have a file in a desk drawer filled with a collection of letters from former players saying, “I wish I would have listened to you when…” Somewhere along the line, most players get it. They wake up one morning and a light bulb goes on above their head and suddenly they understand the big picture. They go from living inside the snow globe to holding it in their hand. Of course, some players never get it until it’s too late to matter. But Katmo got it way ahead of schedule. She had a clear view of the big picture way before she should have been able to see it. She understood her role in the grand scheme. It was never about one game or one season for her. She understood that she wasn’t part of a team, but rather part of a program that was part of a university. She was part of a history being built. She understood that her four years would be her legacy. And because she figured that out right at the beginning, the legacy she created was nothing short of remarkable. It’s funny, because when I say it like that, it seems so simple. It seems like it would be really easy to convince every freshman to approach her career like that. But it’s quite the opposite. Year after year coaches across the country have tried spelling it out for their freshmen, but that snow globe is full of distractions and alternatives and those things make it very difficult to escape it. That’s why the message almost never sticks the first few hundred times. Katmo got it right off the bat, and that’s why she defined what a coach wants in a captain in every possible way including this one: she bought into the concept and she pushed it onto her teammates. A word we threw around a lot down there was ‘culture.’ I had a goal to build a culture of self-governance amongst the players. I wanted the players to set a high standard and live up to it. And I wanted them to hold each other accountable when someone colored too far outside the lines. I wanted them to have the courage to stand up to a teammate who wasn’t living up to the standards. I would often tell them that the more my job was limited to just soccer, the better off we were all going to be. And… should the team leave the issue of enforcement in my hands, well, the many would pay for the sins of the few. It was a good incentive for the players to police themselves. It was a tough sell, asking players to be in charge of disciplining their teammates, but I had the advantage of starting that program from scratch and I was blessed with a few great leaders before Katmo every showed up. It took about three years before that part of ‘the culture’ took root, but once the first domino tipped, it was really something quite amazing. It was preseason of 2005 or 2006, a typically scorching hot August day in Florida. We had finished our morning session more than an hour earlier and would not reconvene until the evening. Just before noon I headed out for lunch and was driving slowly around the back side of our field-house. There was a patch of grass back there that would one day, allegedly, become a softball field. On that patch of grass I saw Katmo bustin’ her tail, running doggies with a few of the freshman. I didn’t know exactly what had happened, but I knew something had. Players spend preseason downtime either eating or napping. They don’t spend it voluntarily doing high-intensity fitness. Not ever. It was my policy not to demand answers when I stumbled across one of these moments. Some players had screwed up; some other players were handling it. That was how it was supposed to work. If I was meant to know the details, eventually the details would find me. In this particular instance, eventually they did. Weeks later I was made privy to what had happened. A couple of freshman were about a minute late to a team meeting. I was shuffling through some papers and didn’t see them when they entered the room, so as far as I knew, no one was late. In theory, they had snuck one by me. But we had evolved past a cat and mouse culture. Being late was wrong, regardless of whether or not I happened to notice. And thus, those two or three freshman were out in the midday sun busting through doggies, their captain beside them each step of the way. I can’t think of a moment that better typifies the type of leader Katmo was. She was a committed leader who bought into the mission 100%. She was strong enough to confront teammates that didn’t uphold the standards and brave enough to dole out the consequences. And she was enough of a teammate – a great teammate – to run right next to them, something she clearly did not have to do. Those freshmen, once the running had ended and the air had returned to their lungs, they walked away from that field with some very important messages. They knew their teammates were serious about what we did. They knew that Katmo was one strong leader. And they knew that in good times and bad, Katmo had their backs. greet each season’s new crop of freshmen. Preseason was like her Christmas morning because she loved that our family had just gotten bigger and she saw in those freshmen the promise of a limitless potential. Every goal we scored was cause for wild celebration. Anytime a teammate scored, Katmo rushed over to celebrate with her, and in the pictures of those moments, Katmo usually looks more excited than the goal-scorer. There’s no faking that type of exuberance. Katmo was painted in her love for our program and her teammates. Every day before training Katmo decided to put our team in the right frame of mind. It was nothing I ever asked her to do but only because I never would have imagined it. Katmo knew that any one of her teammates might have had a stressful day of classes/boyfriends/both/other, and she set out to recalibrate everyone’s mood to its factory settings before we got into the meat of our training session. Our warm-up typically consisted of two lines of players taking a jog around the complex, stopping midway for a stretch, and then jogging to the finish line that was me. As captain, Katmo was always at the front of one of those lines, and each day she had the whole team do something completely off-the-wall silly on the final leg of that jog. Once she had them all rowing an invisible boat; another time they intermittently threw their hands up in the air and screamed as they rode an invisible roller coaster. As the roller coaster snaked through its turns, the lines would lean one way for a few yards and then suddenly snap back the other way. And the players were waving their arms in the air and laughing hysterically. I could only shake my head and smile at the things Katmo could convince her teammates to do. Day after day she thought of something fun and peculiar, and day after day it worked. By the time they got back to me, those players were in a great mood and ready to train. 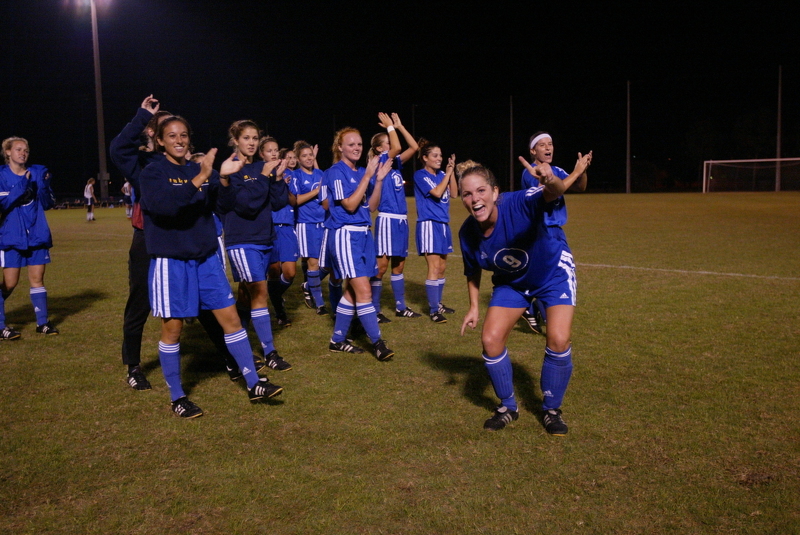 It’s not so uncommon for that to happen on a team, with or without an invisible roller coaster. On any given day, any given player can show up to training in an especially great mood and suddenly there’s a team full of people players who follow suit and everyone is excited about being there. But more likely than not, that one player’s mood is the result of happenstance. Maybe she did especially well on an exam or she got a care package in the mail or her boyfriend surprised her with flowers and a trip to Yo Dawgs (incidentally guys, that’s really good advice). Regardless, the mood found her. A few days later the mood finds someone else. And then someone else. That’s what made Katmo’s presence so amazing – the consistency of her enthusiasm. Her recurring positivity was the Cal Ripken of good vibes. You could set your watch by it. She made her decision to affect her teammates and I know there had to have been days when it just didn’t come naturally. Some days she had to be an actor. So that’s what she did. She acted. Like a leader. Some people think that because they are just one person, they can’t affect the whole. Katmo (and the Happy Parker) understood that because she was one person, she could affect the whole. Most college athletes know this before their careers are done. Katmo just remembered to act upon it. I’ve now coached 22 seasons of college soccer. Coaching Katrina Morgan has been one of the highlights of this very long ride. I am very happy that she’s where she belongs… in the Hall of Fame.